As you walk down Karolinenstrasse in the Bamberg Altstadt you may come across an old building that certainly sounds like it is (or was) a brewery: Bamberger Hofbräu. The name had always intrigued me because the literal translation is along the lines of "Court Brewery." But Bamberg has not had a Royal court in the usual sense of the word. Until 1803 Bamberg and most of Franconia was ruled by a "Prince Bishop" of the Catholic church. The Archbishop of Bamberg not only had great ecclesiastical power, he was also the civil ruler of the Principality. In 1803 the Bavarians invaded and conquered Franconia and thereafter it was ruled from Munich (Napolean gave the Bavarians his approval as thanks for helping him against the Austrians). So I started digging and found an interesting story. The Bamberg Hofbräu restaurant on Karolinenstrasse (above) and a close up of an old lantern (below). In the 1880's a Jewish hop broker from Bamberg named Simon Lessing saw an opportunity. 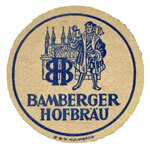 Bamberg had long been a center of the hop trade. It was also becoming a malting center with the new methods of industrial scale malting developed at Weyermann Malz (founded 1879) and others. Bamberg was also a rail hub where North-South and East-West rail lines crossed. (The first German railroad was built in Franconia — from Fürth to Nürnberg in 1835). 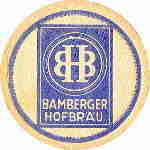 With hops, malt and transportation readily available, Simon Lessing founded in 1885 Die erste Bamberger Exportbrauerei Frankenbräu AG— the first real industrial sized Bamberg brewery and the first to brew beer for primarily export to other parts of Germany and the world (the AG stands for "Actien-Gesellschaft" signifying it is a joint stock company). Within a couple of years it was producing over 50,000 Hl per year, quite a large volume for that time. In 1888 Frankenbräu won a number of medals in the Brussels Worlds Fair. The brewery was on Pödeldorfer Straße near the train station and the malting plants, thereby simplifying transportation. The building in the picture above was their tap room in town. Years later, around the turn of that century, Prince Rupprecht of Bavaria lived in Bamberg (in the Bishops Residence -- really a palace -- next to the Cathedral). 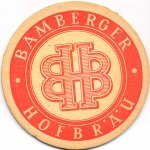 He was such a big fan of the Frankenbräu beer that he allowed them to change their name to Bamberger Hofbräu, giving them a "royal patent" as it were. Something similar to what you find on shops in the UK — "By Appointment to His/Her Majesty ...." A couple of years later Simon Lessing died (1903) and control passed to his 22 year old son Willy Lessing and Simon's widow, Clara. 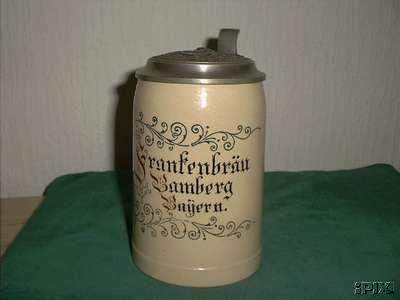 In Germany after the First World War there was a great period of business consolidation and breweries were no exception. 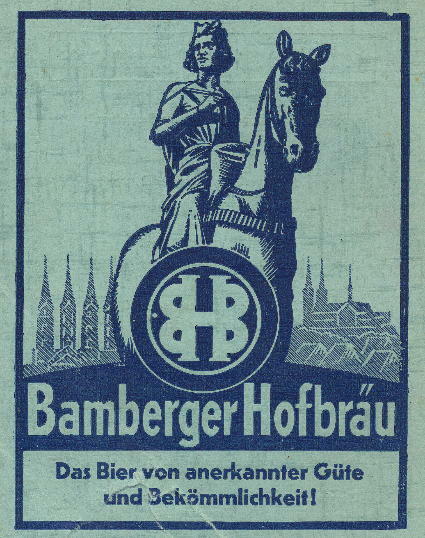 In 1919 Bamberger Hofbräu merged with Erlangen Hofbräu (but production remained in Bamberg). They also bought small local breweries like Brauerei "Weisse Taube" (which was located where the Ibis Hotel is today) and Brauerei Eckenbüttner (which is today the Parfumerei Douglas on the Maxplatz). After the mergers the Lessings remained the majority stockholders. Production increased to over 180,000 Hl annually. What kind of beers were brewed? 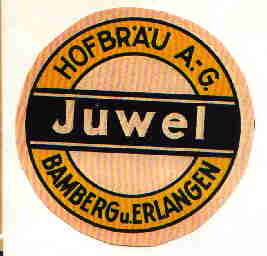 Records show a helles named "Domquell" was popular, along with a dunkel and export. A couple of bocks named "Dominator" and "Exquisator" rounded out the strong end of the beer lines. The "Dom" is a reference to the Bamberg Cathedral (or "Dom"). When the Nazi's came to power Bamberg was not spared the horrors the rest of Germany experienced. 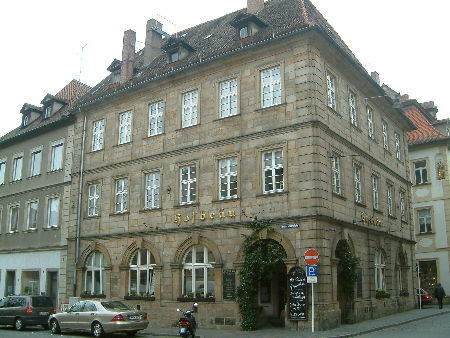 The Jewish community in Bamberg was one of the oldest in Bavaria. Starting in 1934 the Nazi's forced many Jewish stockholders to sell their holdings at fire sale prices. 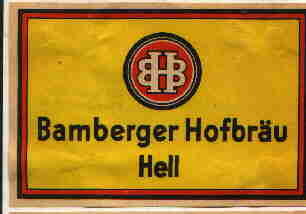 In 1936 the Nazi's appropriated the shares of Hofbräu AG owned by Willy Lessing . Around this time his wife and son left Germany for England (his son, Fred Lessing, later lived in New York City) . Willy stayed in Bamberg. In the evening of November 9th, 1938 ("Kristalnacht") the Bamberg Synagogue was set on fire by the mob. At 2am Willy Lessing came down to the Synagogue and implored the fire department to put out the fire (They did not put out the fire but stood by to make sure the fire didn't spread to nearby buildings.). A gang of Hitler Youth then beat Willy severely. At this time Jews were not allowed into the local hospital but the Archbishop of Bamberg was able to bring pressure to bear and WIlly was admitted. However, he died of his injuries two months later on January 17, 1939, two days before his 58th birthday. After the Second World War, in 1946, one of the arsonists was sentenced to two years in prison and one of Willy's assailants was sentenced to four years in prison. Two others were identified, but not tried. Two years later in 1948 the Bamberg City Council renamed Sophienstrasse, the street where Simon Lessing had his hop brokerage and both generations of Lessings lived, to Willy-Lessing-Strasse. (For those of you familiar with Bamberg, this is the street from the Luitpold Bridge over the Regnitz towards the Altstadt). Fred Lessing appears to have received some compensation, but the he was no longer involved in the brewery. His mother (Willy's wife) had died in London in 1944. 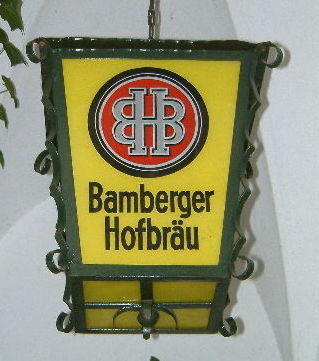 In 1972 the company was aquired by the large Nürnberg brewer Patrizierbräu. Production continued until 1977 when the brewery was closed and torn down. On the site on Pödeldorfer Straße today stands the offices of the local Health Insurance Administration. 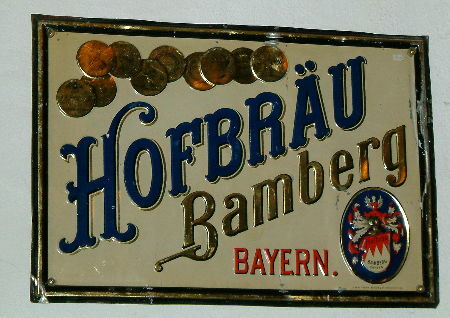 The Bamberger Hofbräu name was used on beers until 1991 when the Munich based parent of Hacker-Pschorr aquired Patrizier and discontinued the brand in favor of their own brands. In the early 1990's a resturant openned at the site of the former tap room and took the name in honor of Bambergs first large brewery. I'll leave you with a photo of a fine metal sign hanging in the Fränkisches Brauereimuseum and some pictures of coasters used thru the years.